Do you tell your story with confidence? 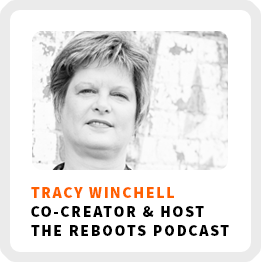 She’s a professional storyteller and the host of the Reboots Podcast based in Fort Smith, AR. Inspired by her father’s storytelling skills, she wants to demonstrate everyone has a great story inside of them that deserves to be told. How experiencing the death of a close friend made Tracy realize she needed to shift her life toward achieving her bigger goals. Why it’s important not to just figure out what we want to do, but also what we believe. She offers insights on how to embrace life transitions. How she is experimenting with different ways of working to find what truly works for her. Wake up time: Some days it’s 6:30am, others it’s 7:30am – usually aiming to be at the computer by 8:45-9:15am, but sometimes it doesn’t work that way. Regains focus by: Usually a walk, but sometimes it takes a hard reset of blocking almost everything off of the calendar that isn’t the central goal. 90-day goal: Identify a dozen or so businesses that are currently or could potentially be benefitting from podcasts and help them with a problem in their process. To start telling your real, authentic story, Tracy suggests the following actions. 1) Ask a whole lot of questions – of yourself and others – to ascertain where your expertise may lie. 2) Think specifically about the life you want to live and find a way to own who you really are.